Gruber, Patrick D.. "Midland". The Canadian Encyclopedia, 26 September 2016, Historica Canada. https://www.thecanadianencyclopedia.ca/en/article/midland. Accessed 23 April 2019. Midland, Ont, incorporated as a town in 1890, population 16 572 (2011c), 16 330 (2006c). The Town of Midland is located on Midland Bay, an inlet of Georgian Bay. It is about 145 km by road north of Toronto. 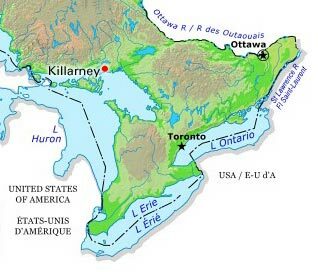 The area was part of Huronia before the arrival of Europeans, and Sainte-Marie Among the Hurons (just outside present-day Midland) was the first European settlement to be established inland from the St Lawrence Valley. Constructed by Jesuit missionaries in 1639, Sainte-Marie was a base for missionary work among the Huron until it was abandoned in 1649. Settlers arrived in the 1840s and it was known as Mundy's Bay, Hartley's Landing and Aberdare. The modern development of the town began in 1871 when it was selected as the western terminus of the Midland Railway from Port Hope via Beaverton. The surveyed townsite was renamed Midland City ("City" was dropped when incorporated as a town) by the railway company in 1872. The railway (opened in 1879) stimulated the logging industry and the town developed extensive harbour facilities and grain elevators. Shipbuilding was also one of the mainstays of the economy for most of the first half of the 20th century, until the shipyards were transferred to Collingwood. Today, the service and trade sectors as well as light manufacturing are the basis of the economy. 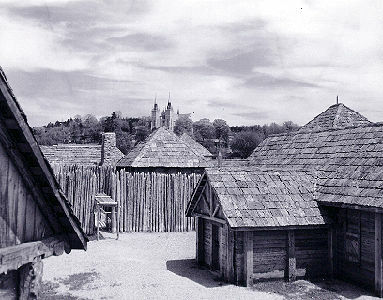 The Huronia Museum and Huron-Ouendat Village recreate Huron life before the Europeans arrived. The nearby Jesuit Martyrs' Shrine and Wye Marsh Wildlife Centre also attract hundreds of thousands of visitors every year. Midland serves as a "waterway" to the popular Thirty Thousand Islands of Georgian Bay.